4 Bedroom Detached House For Sale in Uckfield for Asking Price £1,000,000. 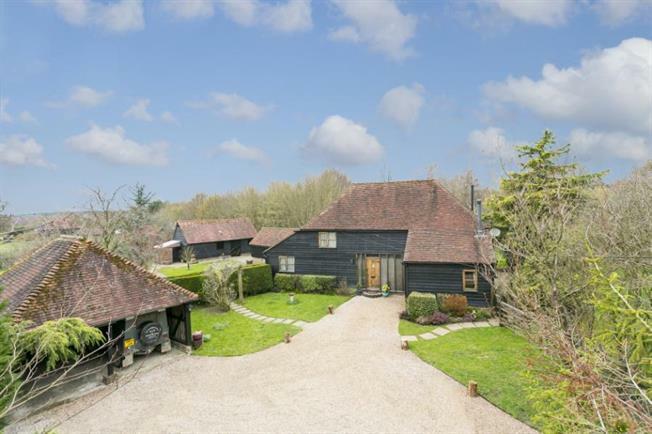 A spectacular converted barn dating to 1700s with many exposed timbers providing a charming, flexible home. Extensive grounds provide a mix of lawns, shrubberies, fruit trees, vegetable patch, hedging, ponds and woodland all eco-friendly. Set in semi-rural surroundings between Uckfield and Maresfield with excellent local amenities: shopping; leisure facilities; Ashdown Forest; horse racing; golf courses; excellent road connections; regular commuter trains from Uckfield, Buxted and Haywards Heath; excellent state and independent schools nearby whilst Glyndebourne, Brighton and Tunbridge Wells offer a rich diversity of cultural events. The property is approached over an extensive gravel drive leading to a detached cart lodge providing double garage and log store. To the rear are the detached stables and dairy used for garden storage. Planning permission for their conversion has lapsed but recent consultation with local planning officers indicated they would look favourably on conversion into a detached self-contained annex. From the front door you will be charmed by the interior, step down to the vaulted family/dining room with door to a patio overlooking the grounds. The kitchen/breakfast room has oak units, integrated cooker, dish washer and fridge and a range. Off the kitchen is a utility/boiler/drying room with back door leading to paved area and garden. On the other side of the family room is a bedroom, shower room and study. Stairs from the study lead to the garden room with stable doors opening onto the old barnyard which now features a patio, lawn and the old well. Off the garden room are two bedrooms, a bathroom and store room. Back in the main barn on the first floor is a vaulted minstrels gallery opening at one end to a TV/snug with gas-fired log-effect stove. At the other end of the gallery is the main bedroom, ensuite bathroom and dressing area.